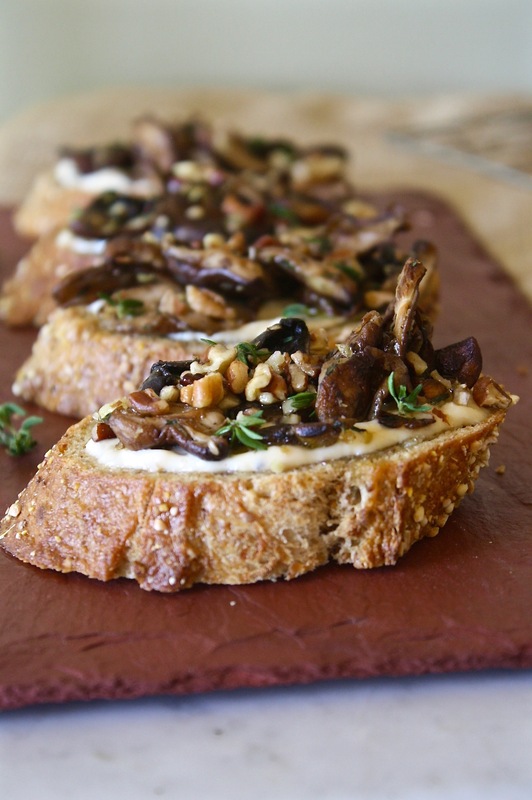 Easy to make and packed with fall flavors, this recipe for mushroom crostini is perfect for fall. 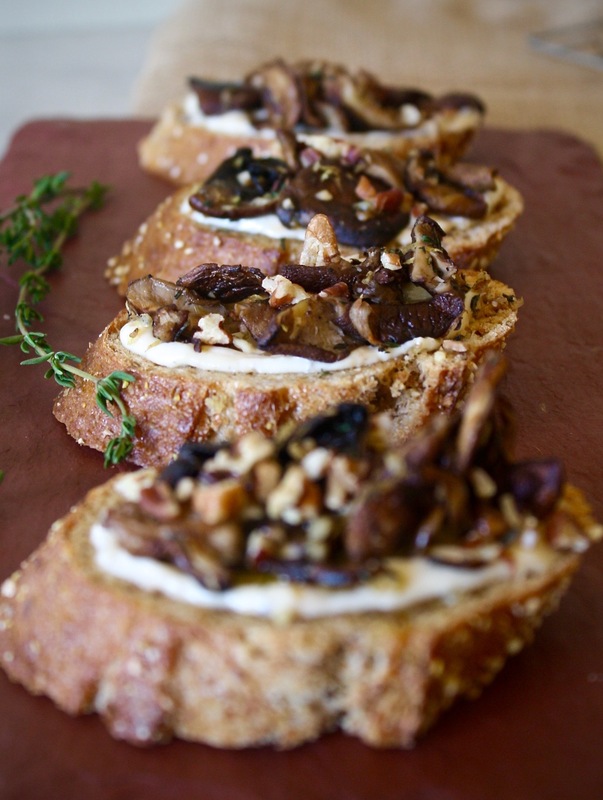 Made with an apricot goat cheese, fresh thyme, lemon, and shiitake mushrooms, this easy-to-make appetizer is a great addition to any get-together or holiday party. In our family we celebrate Thanksgiving for two days. Well, it’s more of a thanksgiving eve, or more accurately, a pre-party. In recent years it’s been dubbed Drinksgiving. Now hold on a minute before you roll your eyes and move on. Drinksgiving does involve…well…alcohol ­­— most notably the dangerous cosmos Aunt Dee always thinks are a good idea, we should seriously rethink that — but it also boasts an incredible menu of small bites and appetizers. There’s usually a beautiful charcuterie board of some sorts, slow-cooked or smoked meat, soul-warming dips, spiced nuts, the whole works. And each year, as the holiday nears, it’s always a challenge to decide what to bring to Drinksgiving. 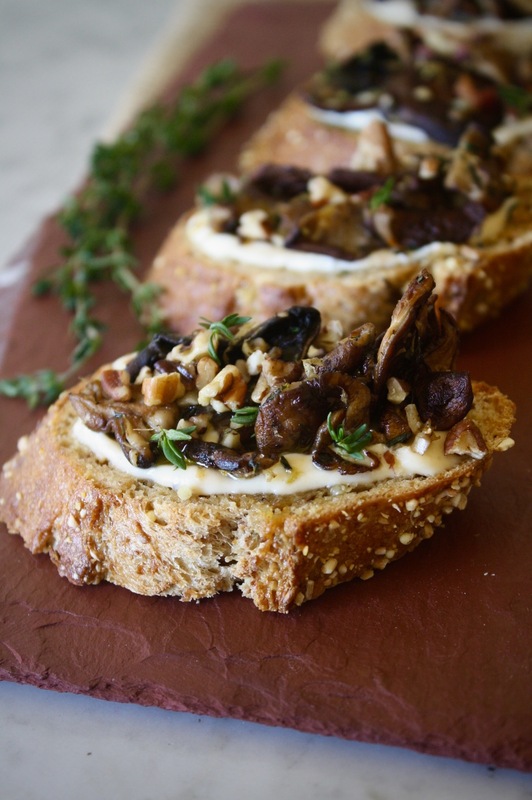 So this year I’m keeping it rustic with a mushroom crostini that’s full of delicious fall flavors from thyme, pecans, and goat cheese. This crostini is a breeze to prepare and most of the components can be made ahead of time, which makes this appetizer perfect for those of us who travel during the holiday season. 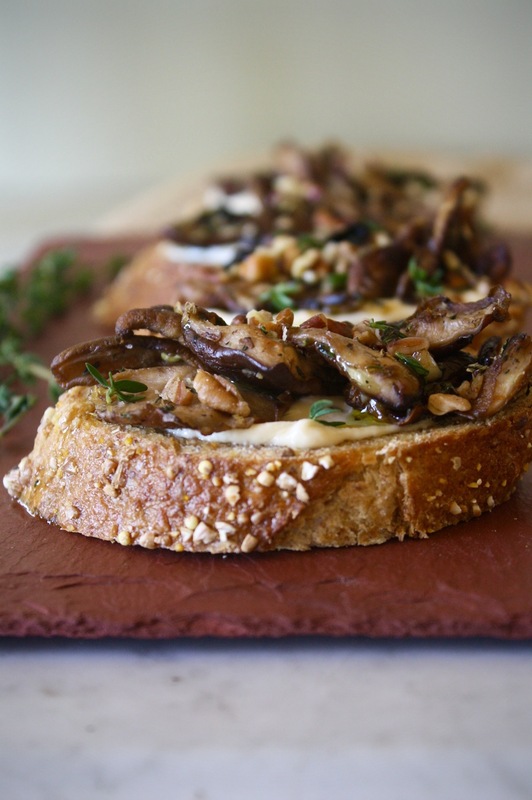 If you love this mushroom crostini (which I hope you do), it also makes a great base recipe to change up. With just a few easy ingredient swaps and you can serve a new variation at every party this year! Arrange bread slices on baking sheet and brush tops with 2 tablespoons oil. Bake slices until golden and crispy, 15 minutes. Let cool 5 minutes then rub toasted slices with garlic clove. In a large skillet, heat remaining 1 tablespoon oil over medium until shimmering. Add mushrooms and cook, stirring every 2–3 minutes until softened and golden brown, 12 minutes. Add garlic and thyme and cook 1 minute. Deglaze pan with sherry, scraping up any brown bits. Remove from heat and stir in zest; season with salt and black pepper. Combine goat cheese, jam, ½ teaspoon pepper, and nutmeg; season with salt. 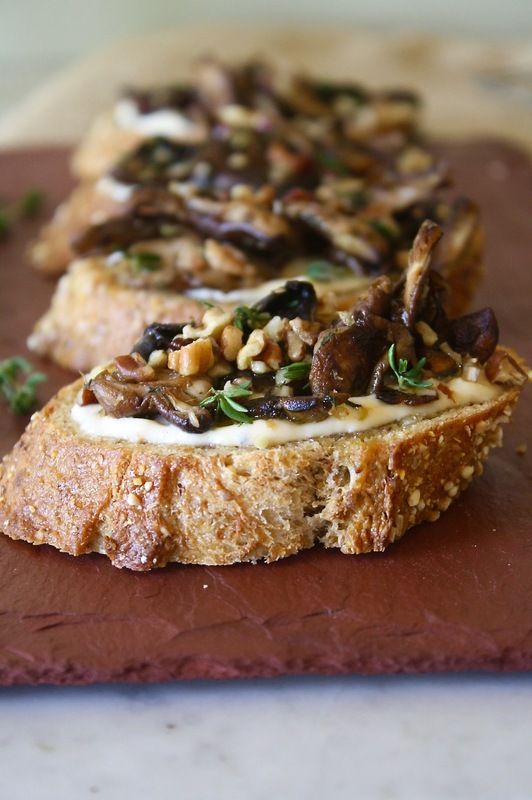 Spread goat cheese mixture on toasted bread slices, top with mushroom mixture, and sprinkle with pecans. Drizzle olive oil over tops, if desired, and serve.